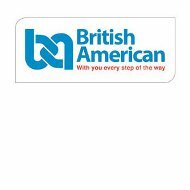 A review of British American Health Insurance Company leads to British American. Surprisingly, it is a company located in Kenya, Africa. Started in 1920, British American provides insurance and financial services to middle class and wealthy Kenyans as well as Kenyans living in London. They also have offices in London, Mauritius, and Malta. If you are looking for personal or corporate health insurance enter your zip code in the free box to compare health insurance rates, now! You may be wondering why an insurance and investment company located in Kenya would be named British American. When the company was started in 1920, it was started by British and American investors who were exploring whether or not London would be a good market place for insurance and financial services of a combined nature between the two countries. British American began to consider adding Kenya to its markets in the 1960s. The reason Kenya was being considered in this way is that it appeared to be the most stable country in Africa at the time. Since many African nations were ruled by European countries into the 1960s, it was not unusual for European and American investors to travel to Africa to seek potential moneymaking ventures. From the time of its founding, British American has grown to provide a wide variety of investment, asset management, and insurance products for individuals, corporations, small businesses, and government organization. Though it has offices in other countries, the Kenya operations are by far the leading operations of the company. British American provides insurance and investment products for both individuals and corporations. For individuals, in the category of general insurance, British American offers motor insurance (equivalent to auto insurance), fire, and perils insurance, Hao insurance, and burglary and house breaking insurance. This last category was added several years ago when ethnic fighting broke out in parts of Kenya and many homes were burglarized. Life insurance options are also available for individuals from British American. Life insurance is an important insurance coverage, especially if you have a family. Protecting your children and spouse from financial problems in the wake of your death is a very loving thing to do, especially if you are the main breadwinner in the family. Starting with a small policy and building as your income and career grow it a good way to get started. The life insurance options available are whole life, vanishing premiums whole life, personal accident insurance, mortgage protection, credit life, and British American specific programs called Mediflex and ACCIshield. The British American specific programs were created by the company to target the specific needs of their clients. They are similar to umbrella coverage, but in a more defined and specific way. Mediflex is a medical coverage option that covers the expense of hospitalization for life. So whether it is a one day stay, or a one year stay or longer, Mediflex will cover the expenses. ACCIshield is a product that covers accidental death, permanent total disability, temporary disability, medical expenses, hospital cash, funeral expenses, and the cost of artificial limbs. For corporate policyholders, British American provides several types of coverage in the property and casualty insurance category. These coverage options include fire and perils insurance, motor insurance, workmen’s compensation, employee liability, public liability, engineering insurance, marine insurance, fidelity insurance, all risk insurance, and money insurance. In the group life and medical category, the options are group life assurance, group personal accident, group critical illness, group disablement income insurance, group disability insurance, and group funeral expenses. Employers can offer all or some of these options to their employees. For corporations looking for investment tools, British American can create market funds, income funds, balanced funds, equity funds, off shore investments, wealth management, and advisory services. In the area of pensions, employers can choose from a group pension that varies based on investment payouts or a guaranteed retirement fund that will not fluctuate no matter what the market does. For businesses that have at least ten employees, British American offers health insurance that covers hospitalization, day care procedures (equivalent to doctor appointments), illnesses, pre-existing conditions, and HIV/AIDS management. Employers can set the coverage amount based on how much the corporation itself wants to contribute to the health insurance policy. I would like to get the Health Insurance cover from British American Company. Would be so much interested to know the amount to be started with and how much I will be paying per month. I will be traveling to Germany in Mid January 2018 and this should be made available before 20th of December because it is needed in the Embassy.